The (Not-So) Secret Musical Talents of the "Stranger Things" Cast! No, they're not trained assassins. (Athough...maybe?) Ever since the first season of the hit Netflix show premiered in the summer of 2016, we have been slowly but surely introduced to the various musical talents exhibited by the breakout stars! As it turns out, rap isn't Millie's only musical milieu -- from Bruno Mars’s "Just The Way to You Are" to Adele’s “When We Were Young”, and even Amy Winehouse’s “Valerie”, her vocal range is obviously insane. A bunch of her old YouTube singing videos have been unearthed showcasing her singing ability from a young age. Considering she’s wanted to be a singer since she was three and was obsessed with High School Musical, the skill may not be surprising. Gaten Matarazzo (Dustin) actually has a history of singing. A video of him performing "The Star Spangled Banner" at the Citi Field Stadium only recently received the massive attention it should. Considering the video is from before "Stranger Things" fame, it was sheer talent that got Gaten and his older sister Sabrina on that field. Allegedly they auditioned by singing a rendition of P!nk’s “F***** Perfect”. As it happens, Gaten was a Broadway performer with roles in Priscilla Queen of the Desert and Les Misérables before landing his breakthrough gig on the Netflix special. 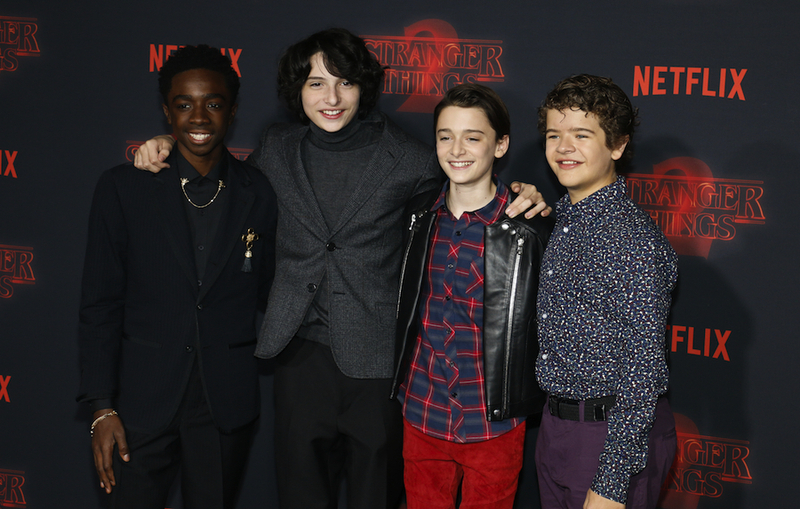 Fast-forward to a couple months later, in November, when "The Upside Down Medley" performed by Gaten and Caleb, as well as Finn Wolfhard (Mike) and Noah Schnapp (Will), on "Fallon" went viral within days, shocking many to discover that the WHOLE young cast has something to offer! Caleb McLaughlin’s self-assurance on stage during these musical numbers no doubt stems from the fact that he studied dance at for a year and attended the Harlem School of The Arts. Professionally speaking, he got his start on Broadway and was involved in a little show you might have heard of called The Lion King, playing Young Simba from 2012-2014. NBD! As for Finn, his cool demeanor leads to his skill sometimes being overshadowed by quirky Gaten, confidant Millie, and smooth Caleb. He may play the slightly awkward Mike Wheeler on the show, but he’s a bonafide musician in real life as the lead singer and guitarist of alternative band Calpurnia (which signed to Royal Records in November). The news keeps getting better as they will be releasing an EP early next year. Considering he has an insane following of young girls on social media who swoon over his every move, we’re sure the EP will do well. Finn's not the only one getting his rock on though. Joe Keery (Steve), for example, whose famously big hair may count as a talent on its own, studied theatre and went on to become one of the guitarists for the band Post Animal. They released their debut album in October 2015. Meanwhile, Joe's on-screen romantic rival, Charlie Heaton (Jonathan), spent some time touring with the London-based band Comanechi as their drummer. Now then... who else is hoping for a full musical episode in Season 3?? ?